Normally this would be accompanied by a number of drills of different sizes either made with stone, chert, flint or some other hard material. The traditional drill was a wooden spindle wrapped in a turn of leather cord and twirled by the back and forth motion of an ivory bow. The upper end of the spindle was held by a mouthpiece inset with a cupped bearing of smooth stone. Craftsmen kept sets of spindles with different sized bits made from stone or iron. 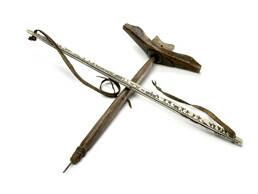 Drill bows were engraved with life scenes, like this these showing hunting and dog sledding.